If Your Favorite Part of BBQ Isn't Eating, You're Doing it Wrong! It's been a while since I did a barbecue sauce giveaway contest, and I'm excited about this one - Garland Jack's Secret Six and a t-shirt to boot. 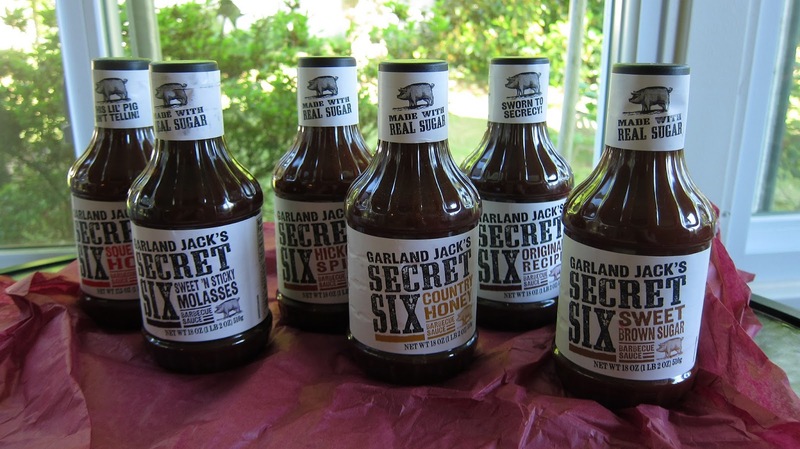 Garland Jack's uses only sugar in these rich barbecue sauces, and you really can taste the difference. It's a cool collection with the Original flavor, Country Honey, Hickory Spice, Squealin’ Hot, Sweet Brown Sugar and Sweet n’ Sticky Molasses. Something for every barbecue lover. Gotta love the variety, and they are all included in the giveaway contest. As always, I keep my giveaway contests simple, and I NEVER spam you. I don't collect your data. I just contact the winner. To enter, just leave a comment telling me which Garland Jack's barbecue sauce you think you and your crowd would love best and why. Check out Garland Jack's BBQ sauce site if you need more information to decide. Some people like extra entry chances, so you can share the post on FB, Twitter, Google + or other social media outlets for extra entries. Stop back and let me know where you shared, so I can add the extra slip(s) in the draw bucket. Do a new post for each entry, although I'll read them all and add if someone forgets. I will need some way to get in touch, so include something so that I can follow up on the winning slip. Usually this is an email, but if you're on any of my social media lists, you can leave a handle and where to look you up. I'll take entries through June 8th (2013) at 10 pm EST and draw either late on Saturday or on Sunday. I do make paper slips and put them in a hat or bucket, and a family member or neighbor (not connected to the blog in any way) draws. I'll contact the winner, and Garland Jack's will send out the prize. It's a nice big box with the full line of sauces and a t-shirt. I'm hosting, but the company takes care of the prize. Thanks Garland Jack's. I also got the six pack of sauces, but I'm not paid to do a contest. I just enjoy seeing readers get a chance to try out some of the great products I try out at home. Get back by Tuesday June 11th (2013), or I'll need to draw another name. I've never had to do a second draw, but it makes sense to have a time on that. Good Luck! This is a really great prize and just in time for summer grilling season. OK Ms. Cyndi, it looks like I will be the first one.... I can not say I have seen these on the shelf.... so, I wish I could request a mix, but since I can't, I will take a six pack of the original.... I am always willing to try something new, and have found some very good ones out there on the shelves of the stores, just like you have. So, put my name in the hat. Ok Ms. Cyndi, I can't say I have seen this brand on the shelves.... so, with that said, I would love to get me some samples to try... I love trying new ones. I just wish the six pack would be a variety pack, but since you said to pick the one that I want, I suppose I will sample the original. Sweet Brown Sugar sounds really good. You can contact me through facebook. Good luck to all that enter the contest. Not sure if my first comment posted or not Cyndi. Sweet brown sugar sounds good. Good luck to all that enter. You can contact me through facebook. Cyndi, as we say in the South, the Sweet and Sticky Molasses Garland Jack's Sauce sounds jes' right! Definitely the Honey flavor! Sounds sweet :) literally! Sweet brown sugar sounds good. Good luck to all that enter. I would like the hot one but my family would prefer one of the sweet ones. They all look good. Becky - had problems getting Blogger to work. FB friend. Please enter. Steve - winter griller. Likes all barbecue sauce. Enter. Steve (WG) - I always like to start with the original, but they all look good. I would love the sweet brown sugar BBQ sauce! We love brown sugar anything in our house! This would be delicious on chicken, shrimp, even fish - YUM! It would have to be the sticky sweet molasses for the win. But i'd love to try them all. I'd want to try original. Because I have a sweet tooth, I think Country Honey or Sweet Brown Sugar would be my favorite. Squealin’ Hot sounds like something my husband and son-in-law would eat. I'm pretty sure at least one member of my family would like each of the delicious sauces. Thanks for the giveaway. My choice would be the Hickory Spice, but I know that my husband would choose the Squealin' Hot!! I love the smoked taste, and he likes a bit of heat with his! I want to enter into this drawing...but not sure how to do it...so I will just leave a comment...those sauces sound lovely. sweet and sticky molasses's sounds good! Tara likes the sweet and sticky one. Yum. As a previous winner . . .I am anxious to try again..!! Never did thank Cyndi for the sauces, grill tools, and meat thermometer . . .which we still use to this day..!! Which sauce liked best..?? Squealin’ Hot of course ...cuz everyone likes it hot..!! The Hickory Spice sounds like something our family would love. Thanks so much! Sweet brown sugar, for the husbands sweet tooth by all means! Sweet brown sugar for the husbands sweet tooth! I'd try the molasses one just because it's sticky. You can find me at WG if I win. The Squealin’ Hot, Sweet Brown Sugar sounds like a winner I would like to try glazing on a few racks of spare ribs because I am always looking for a new go-to bbq sauce! It is a toss up which one I think we would like but I would pick either the Country Honey or the Squealin Hot... probably mix the too!! WG Marv - I want to try them all. Hickory Spice sounds awesome, but then they all do! mmmm, I think they all would be tasty. This is Lon from Missouri. Me and Burr would love the heck out of some Garland Jack sauces - any of them. Dan B. from Winter Grillin on FB - looking for win. Love to barbecue year round and with sauces. Of the 6 flavors, Hickory Spice is the flavor that interests me the most. Just in time for the 4th of July camping trip! I think my favorite would be Hickory Spice because it sounds interesting! I love to try new sauces! I think the hickory sounds good, but would love to try any of them. I'd like to share it with my son, who is the best cook in the family, specializing in smoked meats. Thanks!